A murder mystery turned into a melodramatic murder thriller, Gerd Oswald’s A Kiss Before Dying might not have the shocks of the original book (though there is one doozy of a twist midway through the movie), but it rather effectively gets across its story of a murderous psychotic with a decent amount of tension and a handful of top stars putting forth the story. Plot: A ruthless college student resorts to murder in a futile attempt to marry an heiress. A murder mystery turned into a melodramatic murder thriller, Gerd Oswald’s A Kiss Before Dying might not have the shocks of the original book (though there is one doozy of a twist midway through the movie), but it rather effectively gets across its story of a murderous psychotic with a decent amount of tension and a handful of top stars putting forth the story. If it’s not as good as it might have been, it’s certainly entertaining enough. College student Bud Corliss (Robert Wagner) is dismayed to learn from his girl friend Dorie Kingship (Joanne Woodward) that she’s almost two months pregnant. She insists on a quickie marriage even though Bud thinks if they wait awhile, something may happen to abort the baby. When Dorie persists in marrying, Bud tries various ways to rid himself of the problem including pushing Dorie down a section of bleacher seats and tricking her into taking capsules filled with arsenic telling her they’re vitamins. When all of his carefully planned schemes fail, he lures her to a tall building and pushes her off the top of it. Dorie’s millionaire father (George Macready) is quick enough to believe it was suicide after receiving a note Bud had tricked Dorie into copying in her own hand that read as a suicide note and learning she was pregnant at the time of her death. But Dorie’s older sister Ellen (Virginia Leith) isn’t so quick to believe her sister would kill herself and takes it upon herself, with the help of Dorie’s tutor Gordon Grant (Jeffrey Hunter), to learn the identity of the man involved with Dorie believing that he is the one responsible for her death. Ira Levin’s book left the identity of the murderer a surprise until the end, but screenwriter Lawrence Roman, while making it clear Bud is a killer and something of a psychotic, has his own surprises to spring (at least for those who haven’t read the book at all), and the clues that Bud attempts to erase during the movie that point to him as the killer while occasionally farfetched still work rather well as the web around him draws tighter as his carefully planned schemes hit snags along the way. Director Gerd Oswald uses the wide Cinemascope screen to good advantage early-on separating the lovers and later Bud and his too-attentive mother (Mary Astor) on opposite edges of the frame showing the wide gulf that exists between their points of view. Later, he handles an engagement party smoothly, and the climactic showdown between killer and his final victim might be telegraphed a bit too obviously (with the final damning piece of verbal evidence planted very early in our minds and clearly the thing that would reveal his true nature) but still offers a fair share of tension and excitement. It’s a real change of pace role for the generally sunny Robert Wagner, and while the charm boy looks and demeanor go pretty far in disguising his dangerously true nature, he still doesn’t quite reach the depths of his psychosis that a more gifted actor of the era (Brando, Clift, Dean) would have achieved. There isn’t much evidence in Joanne Woodward’s mousy performance as the trusting Dorie that she’d be able to deliver a knockout performance of such depth and breadth in The Three Faces of Eve just a year later. Dorie comes across as rather simple-minded and blind to the truth and is more than a little irritating in her utter naiveté. Virginia Leith is blandness personified as Ellen, and Jeffrey Hunter isn’t much better as concerned school official Gordon Grant. For the more galvanizing performances, look to the older professionals in the company: George Macready as the tough, demanding paterfamilias, Mary Astor as the clinging mother of the killer who can only see perfection in her son, and Howard Petrie as the chief of police who falls down on the job of investigating the murders thoroughly. Robert Quarry as a student sucked into the maelstrom of the investigation has a couple of excellent scenes with Virginia Leith and later with Robert Wagner. The Cinemascope theatrical aspect ratio of 2.35:1 is rendered in a 1080p transfer using the AVC codec. MGM has delivered a very erratic transfer of variable quality throughout. Sharpness runs the gamut from excellent to poor, and the color timing is all over the map from outstanding and lifelike hues to a cool blue tint to the imagery with pinkish skin tones. Contrast is sometimes true and at other times milky and inconsistent. There is far too much dust, dirt, and damage present (including some missing frames), and the reel change markers crop up occasionally, too. The movie has been divided into 8 chapters. The DTS-HD Master Audio 2.0 mono mix features a strange kind of grinding sound that crops up midway through the movie and repeats at various intervals until the end, sometimes loud enough to blot out the dialogue. Lionel Newman’s background score and title song are mixed with surety with the dialogue and the occasional atmospheric effects and together work hand-in-hand. There is some hiss which can be heard and occasional flutter, too, though not constantly. 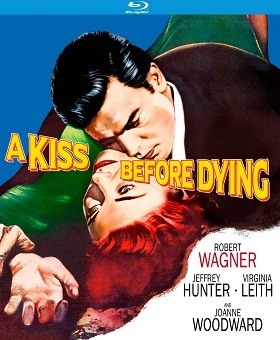 The movie itself of the 1956 version of A Kiss Before Dying features a well-known cast of actors playing characters quite different from their usual portrayals, and that makes it a movie worth sampling, but the Blu-ray disc release offers such mediocre quality that it’s more distracting than enlightening. Well, the DVD is acceptable – to me, at least – so, as this transfer is less than ideal, I'll stay with standard definition. watched my copy Sunday. Sorry to say, the reviews are pretty accurate. Very inconsistent disc, at times looks great then colors shift in the middle of a screen, frames are missing, all as Matt indicated. All in all, watchable but probably not better than the upconverted DVD. A disappointment. So is the recommendation not to buy this Blu-ray and stick with the DVD? The reviews and comments seem to be consistent which is annoying because I like this film and was hoping the image quality would be similar to the excellent Violent Saturday. I will get this on a price reduction. I have it here but haven't had a minute to even check it out. Can do that on Sunday. Here we go again – there is no shift to blue, nor is the color on view especially vibrant or accurate. It's a pretty crappy source or a crappy transfer and a weird one, but there is no shift to blue (oh how I wish we could just leave that in the dust by now) – I have the DVD somewhere and haven't compared but will try to do so. I doubt that people would be hard pressed to see the difference between the Blu-ray and the DVD. The inconsistencies that have been mentioned should not be as visible with a lower resolution source as DVD so that would be a plus for the DVD. According to IMDb the aspect ratio should be 2.55:1 not 2.35:1. Some scenes look cropped a little too tight.